Rome's seaport for most of history was Ostia and a visit to the archaeological site, Ostia Antica, builds a powerful image of a vibrant Mediterranean port from the earliest Roman time up to the mid-16th century. Close your eyes and all the noises and smells of an exciting, energetic seaport flood your imagination. It was here in Ostia that Rome brought the wealth off its empire back home. The wheat from Sicily and North Africa, the treasures and genius of Greece, the silks and spices of the great road from China, the dyes and silks of Carthage, the wines of Bordeaux, horses and metals from Cadiz even tin from those sullen islands in the north. ​But what Happened to Rome's Prime Port? Over time, Earthquakes and other natural disasters changed the flow of the Tiber and the river abandoned Ostia just as the sea drew back from the seaport's doorstep. So, as part of the ebb and flow of history, one of the great ports of history became a memory. 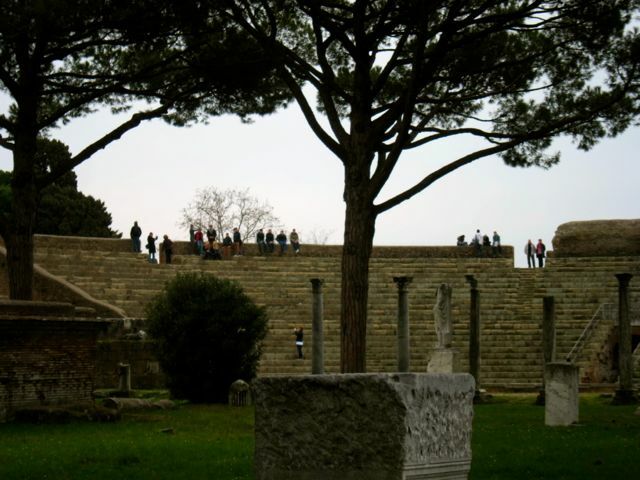 Ostia Antica is easily reached from Rome through the subway and train system. We had been in Rome several times but missed going to this place. This time, after reading books on the Roman Empire, we gave this place a day and we were really pleased. There is so much to see and to understand of the life of that ancient town. As one goes through the remains, one can reconstruct some of the vignettes in the life of the busiest port in the ancient Roman colossus. This was bridge to the world. The Roman Empire made Ostia Antica a prime city. Its port served the empire and was the link of this powerful empire to its center, Rome. What better way to understand this great Roman port than to dig deep into the Roman Empire and the extent of its reach and power. 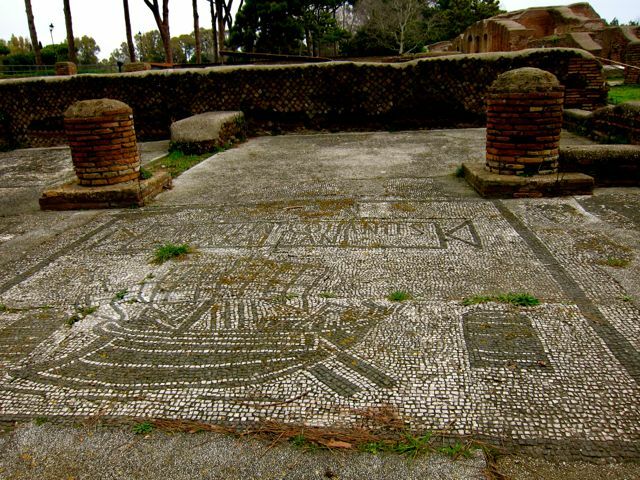 Ostia Antica, for more than a millennium, was a bustling port of about 60,000 people and leaves a history that gives ideas about Roman trading ports. You can find the classic Roman Theatre, Forum, Roman baths, Latrines, storehouses, trading places and beautiful mosaics advertising the specialties of each trader. Make sure you don't miss any of these. Follow the main road of ancient cobbled stones. 2. Porta Romana. 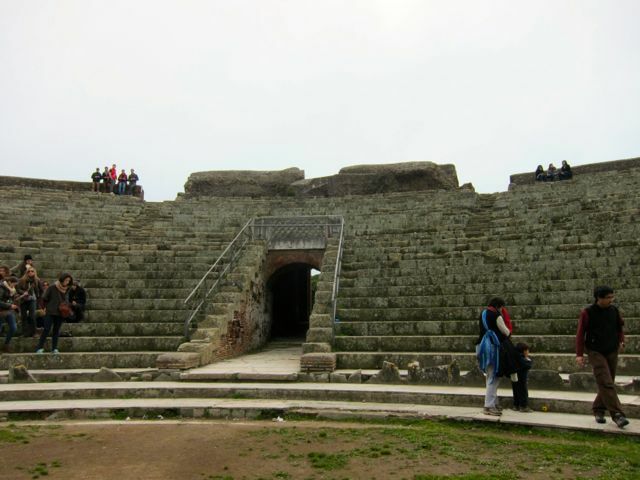 The Gates of Ancient Ostia. 3. Terme di Nittuno. The Baths of Neptune. 4. Casa di Diana. House of Diana is a tenement for lower middle class. 6. Magazzini Repubblicani. Being a port city, warehouses are important. 9. Foro. Forum. Go also to the Therme del Foro. 10. Museo della Via Ostiense. This is located in the Piramide station.